I started cooking tonight’s dinner this morning at about half past eight, before anybody else was awake, and most importantly, before any of the neighbours had hung any washing out to dry. Short beef ribs take a long, long time to cook, and they’re at their very best when they meet a little smoke. So, I made this introduction early on a Saturday morning, alone in the back garden, burning the dew off the grass with a serious pile of fire and a lot of oak scented smoke. Beef ribs are everywhere at the moment, but the best place to get them is the market. The butcher had two great hunks of meat, each with two substantial ribs and a good ten centimetres of flesh, proud slabs of meat from an animal that had worked hard and eaten well. I bought both, about five kilos, about twice as much as I needed, and not cheap at about £25 for the pair. One piece fed four very well in the end, with plenty left over for late night fridge grazing and sandwiches. The beef needs some flavour, so I sprinkled it liberally with a couple of tablespoons of a general multipurpose Cajun spice rub I make frequently and store in a jar. This is a magic standby, capable of transforming meat and fish into fiery, tasty goodness. It’s worth making a batch and keeping it to hand – the uses are endless. All you need is a blender. Add a tablespoon each of black peppercorns, salt and paprika to the blender, along with a teaspoon each of cayenne pepper, cumin seeds, coriander seeds and dried thyme and blitz to a fine powder. A tablespoon or so of this dynamite should be enough for a 2.5kg slab of ribs. So, to smoke the ribs, I used a Landmann offset barbecue. This model has a firebox on the side, and the idea is that you light a charcoal fire in the small box and put your meat on the racks in the main barbecue. The smoke from whatever wood chips you use travels through a hole between the firebox and the main chamber, and it works very well. 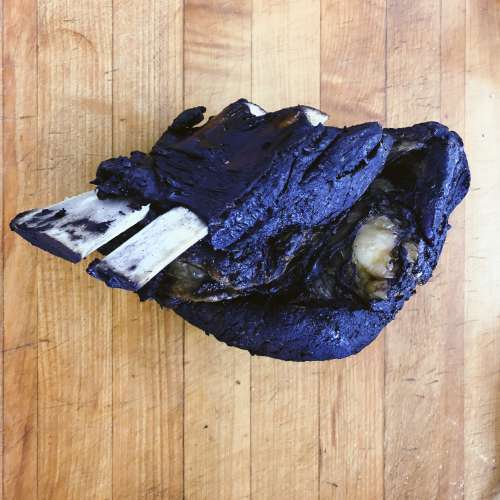 It’s entirely possible to maintain a fire and cook short ribs from start to finish in this manner, but that takes a significant amount of commitment as the fire needs to be looked after for at least eight hours. Cheating a little, I gave the ribs a good dose of smoke for an hour, then transferred them onto a grill rack set above a roasting tin, poured a big glass of water into the tray and sealed the meat in with a double layer of foil, roasting in the oven at 100c or less for the rest of the day, at least another eight hours. Done this way, it’s an effortless dish, one that gently behaves itself at the bottom of a low oven for the whole day. You could make a barbecue sauce, but I think these ribs are best left to speak for themselves. The smoke has a song to sing. Serve with chips and a salad, nothing more.